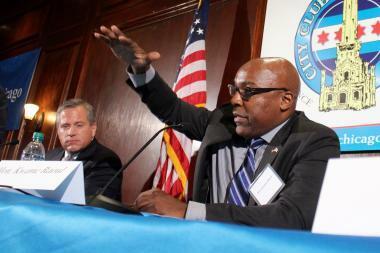 CHICAGO — State Sen. Kwame Raoul (D-Chicago) will propose a "data-driven" bill in the Illinois General Assembly to crack down on repeat gun offenders, he said Monday. Speaking to reporters after a luncheon at the City Club of Chicago, Raoul said the bill would "create a sentencing guideline" that calls for more jail time for people repeatedly convicted of gun-related crimes. Still, the bill would not set ironclad minimum sentences for any particular crime, he said. "So if you're giving 3-14 [years of prison time] for unlawful possession of a weapon by a repeat offender, you can push toward the higher range of that sentence," he said. "You can target, through the data, which offenders should serve longer sentences." Raoul announced his support for the bill, which has yet to be written, alongside Chicago Police Supt. Eddie Johnson on July 1. Johnson has been calling for state lawmakers to enact stiffer penalties for serial violent criminals since before he became top cop in March. He echoed that call in a Sunday press conference, after announcing murder charges for the two men accused of killing Nykea Aldridge, NBA star Dwyane Wade's cousin, last Friday. Brothers Derrell and Darwin Sorells had both been on parole after serving portions of six-year sentences for violent crimes, police said. Derrell, 22, had been released from prison just two weeks before the shooting that left Aldridge dead. "This tragedy isn't just noteworthy because Ms. Aldridge has a famous family member," Johnson said. "It's noteworthy because these two offenders are a prime example of the challenge we face here in Chicago with repeat gun offenders who...clearly don't fear the consequences of their actions." Johnson has repeatedly insisted that the same 1,500 people — most of whom are catalogued on the department's "strategic subject list" — are causing nearly all the city's violent crime. If prosecutors and judges more aggressively targeted that group, he's suggested, the city would be able to put a lid on its surging violent crime rates. That effort has met some resistance because people "are afraid of casting a large net over minority communities," Johnson said earlier this month. "But that's not what we're doing. We're using a spear to target repeat gun offenders." It's that kind of precision, Raoul said, that will inform the guidelines etched into his bill. "Given that [police] have data that targets those people, we can have policy that matches that data," he said. Raoul said he was "fairly confident" the bill would pass during the General Assembly's next legislative session in November.